Head of HR at An Garda Siochana John Barrett resumed giving evidence, before Supt Noel Cunningham was questioned (more about Supt Cunningham’s evidence later). 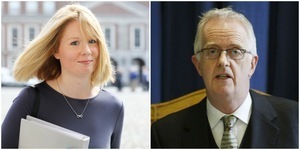 Mr Barrett claims that, following a meeting involving former Garda Commissioner Noirin O’Sullivan and former Chief Administration Officer Cyril Dunne, he was asked to stay back and Mr Dunne made a comment to him in relation to Sgt Maurice McCabe and the O’Higgins Commission of Investigation which took place in 2015. He says that he was told by Mr Dunne “we’re going to go after him in the Commission”. Mr Barrett said he believes the “we” was a reference to the executive of An Garda Siochana. Mr Dunne – who is scheduled to give evidence tomorrow afternoon – denies this ever happened. Mr Barrett didn’t take a note of this alleged remark and can’t specifically recall when this meeting took place. But, based on looking at emails, he believes it was on May 13, 2015 – the night before the hearings of the O’Higgins Commission of Investigation began. On Friday, the tribunal heard Conor Dignam SC, for Ms O’Sullivan, say she was in the UK on May 13, 2015 and left the UK at 5.35pm. 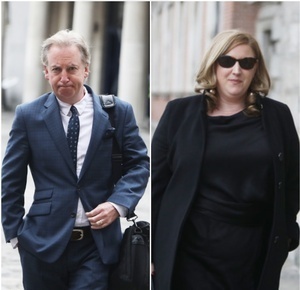 Yesterday Mr Dignam told the tribunal Mr Dunne has said he wasn’t in Garda HQ – where the alleged meeting took place – from 6pm on May 13, 2015 as he had “important” meeting related to a sports club in Wicklow of which he is honorary secretary. Mr Barrett maintains the remark was made to him and Mr Dunne maintains it wasn’t. Yesterday, Judge Peter Charleton, who is overseeing the tribunal, put specific questions to Mr Barrett. He asked Mr Barrett about his view of Noirin O’Sullivan as a Garda Commissioner in 2015 and why he didn’t contact her immediately after this comment was made to him. He asked why it took him two years to tell Sgt McCabe about the alleged remark. And he then asked him about his relationship with Mr Dunne – drawing attention to the fact there had been newspaper reports that suggested there was some conflict between them. 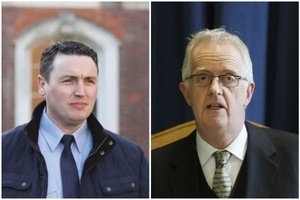 The questioning prompted Michael McDowell SC, for Sgt McCabe, to say that if questions put to Mr Barrett might infer that Mr Barrett had some kind of grudge against Mr Dunne then either the judge, or some counsel, should ask Mr Barrett out straight if that was the case. Some tetchy exchanges then followed between Mr McDowell and Judge Charleton. Judge Peter Charleton: “When we go back to this time, you are in Human Resources, it’s 2015, it’s early 2015, and you are in the job quite a short time, I think. You joined, what, the end of 2014? Charleton: “Yes. So you had got to know the Garda Commissioner by then? Barrett: She was — I met her before I accepted the job. She hadn’t interviewed me, but I went to meet her in her office before I joined the job. Charleton: And you made what offer? Barrett:I felt that she was going to try and bring about change in the organisation. Charleton: Did you feel she was a genuine person? Barrett: At that point I had absolutely no difficulty with the mission that she set out to me. Charleton: That is not the question I am asking you, Mr. Barrett. Barrett: Yes, I did feel she was genuine. Charleton: Did you feel she was a truthful person? Barrett: I did, I did, absolutely. Charleton: — did you feel she was genuine about that? Barrett: Yes, I believed that. Charleton: And did you feel the efforts that you were putting in place, including the lengthy efforts that are detailed in the minute where you were driving along in your car, did you feel that they were actually engaged in, not from the point of view of public relations but from the point of view of setting things to right? Barrett: I absolutely believed that, and at the end of that journey, Judge, I was quite pleased with the day’s work, yes. Charleton: You were personally investing heavily in this as well? Barrett: Yes, my credibility, my time, my energy. Charleton: In the event that this turned into a success, clearly it would be a success that you would have led as Head of Human Resources? Barrett: It would have been a collective effort. And I am not driven by individual accolades, but I would have taken some considerable personal pride had it been successful. Charleton: So there you are, you are in May, you are in the job seven months. Charleton: And your boss turns to you, having asked you to remain behind after a meeting with the Commissioner, who is genuinely attempting to move the Gardaí forward and to engage with those who make protected disclosures, and your boss tells you: by the way, we are going to ruin it all before the O’Higgins Commission? Barrett: He didn’t say that. Charleton: Well, I am finding it hard to construe it any other way. We are going after Maurice McCabe before the O’Higgins Commission. How do I construe that, Mr Barrett? Barrett: I am alarmed by it, but I don’t understand it fully, Judge, that is the reality. I didn’t understand. Charleton: You told me, Mr Barrett, that you had a visceral reaction to it. Visceral, of course, refers to your stomach, your intestines. Charleton: Why did you have a visceral reaction to it? Barrett: I have genuinely invested, time, energy, commitment in trying to move this thing to a point away from conflict. Maybe it’s naivete on my part, but I thought, simply, Judge O’Higgins was going to review all of the facts of the matters that were arising on the terms of reference and make a judgment on those facts, that it wasn’t going to be adversarial in its — that was my view. And clearly, what I had — just the shot fired across my bows was, this is something different. And I was conscious in hearing it, and it’s easy to be wise after the fact, of Maurice — of Sergeant McCabe’s doubts about the bona fides of the organisation when we first met in February. And I hadn’t won Sergeant McCabe over to suddenly believe that the organisation was, you know, after changing its perspective entirely. So this was a work in progress. Charleton: And your visceral reaction, is what I asked you about. Barrett: I felt my stomach tighten. Barrett: I have — it’s just a feature of who I am, sir. I respond to things physically if they either shock or surprise. Charleton: Did you feel that the process you had started was going to be ruined in consequence of what Mr Dunne revealed to you? Barrett: I didn’t know that, but what I did know was, the process I was embarked upon was bearing fruit and I was protective of it. Charleton: Well, what interpretation did you put on the remark you say that Mr Dunne made to you? Charleton: That is not what I am asking you. I am not interested in the terms of reference. I know the terms of reference. Right. You looked at them. What interpretation did you put on the remark that Mr Dunne made to you? Barrett: That there would be conflict at O’Higgins of some sort. Charleton: And how would that impact on the work that you embarked on? Barrett: I felt that it would damage it. I felt it could possibly damage it. Charleton: Do you mean possibly, or were you more definite about that, given your visceral reaction? Barrett: Possibly. It could possibly damage it. Charleton: Was it not appropriate, therefore, for you to ring the Garda Commissioner, a person whose genuineness you believed in and a person you trusted, and said, look, there may be a problem in relation to the O’Higgins Commission and the way it’s being approached, could we have a word about it? Barrett: I very much regret not doing that, Judge. Charleton: I am wondering why you didn’t do it? I am not wondering about your regrets, Mr. Barrett. I am wondering why you didn’t do it? Barrett: I think that I was probably swept forward into all of the other things that were going on and didn’t do it and let the matter unfold. To a degree, I vested trust in the process. I perhaps shouldn’t have. Charleton: Maurice McCabe trusted you? Charleton: And by not doing this, you were prepared to see somebody else, on your account of things, undermine his trust in the organisation, of which, by the way, you are a part. Barrett: It weighs heavily on me. Charleton: Whether it weighs heavily on you now or not, is neither here nor there. I am asking, why did you not react by ringing the Garda Commissioner and asking her what was the explanation for this and pointing out to her, look, there may be issues ahead in the event that this particular strategy is followed through, which conflicts with the strategy that we had already agreed and settled upon in numerous meetings? Barrett: I don’t have a good answer to that, Judge. I don’t. I should have, and I didn’t. I was troubled by it. And then the matters unfolded over the coming weeks. I sought to continue to build a bridge with Maurice. The record shows that it’s sustained. Many of the initiatives that were spoken of, as far back as February, did not continue. Charleton: It took you two years to tell him about this remark that you say happened. Charleton: Why did it take you two years? Barrett: Because the nature of my engagement — I am representing the organisation in my dealings with him. There are very specific issues arising in that relationship, as I saw it. I was, as I said yesterday — or Friday, in seeking to try and maintain Chinese walls, I wanted to represent the organisation. Charleton: I really don’t understand this phrase about Chinese walls. I really don’t know what you are talking about when you say “Chinese walls”. It’s a phrase, by the way, that is used in relation to large firms of solicitors that seem to be representing opposite sides of Government agencies through the same firm. Now, I don’t know what it means, but let’s move on. Yourself and Mr Dunne, have you stayed in contact since he left the organisation? Barrett: I shook his hand when I met him here on the 8th. Charleton: That’s not what I asked you. Charleton: Mr Barrett, that’s not what I asked you. Barrett: No, we are not socially engaged. Barrett: I have no good answer for that. I mean, we had a professional relationship. There are many people for whom I have had — who have been working colleagues that I am not professionally engaged with, and there are people I have long, long engagements with. Charleton: That is fair enough. For those perhaps who read the newspapers, it may appear that the two of you have been in conflict in relation to the interpretation of certain issues over the course of the last year or so. Would that be correct or incorrect? Charleton: Forget about the issue. Just please answer the question. Barrett: On one specific case, yes. Barrett: The financial irregularities at the Garda College. Charleton: And you are saying what and he is saying what? Barrett: Well, this matter was played out in front of the Public Accounts Committee. Charleton: Just tell me, if you wouldn’t mind, please. Barrett: The issue of how those matters were investigated and dealt with. Charleton: And your view on the matter is directly contrary to his? Barrett: Partly contrary to his. Partly. At the very beginning of that process, which was May of 2015, Cyril and I were in lockstep as to what needed to be done. Charleton: It’s made headlines, hasn’t it? Barrett: I haven’t studied the headlines in the last number of days, but I have followed it as it played out in the PAC. Charleton: Thank you very much. Charleton: Now, Mr McDowell, that is going too far. Charleton: No, it is going too far. McDowell: Otherwise your questions seem to be irrelevant, Judge. Charleton: What exactly is the point you are making, Mr. McDowell? McDowell: Precisely the point I made; that if it is going to be inferred, from the matters that you have just raised with the witness, that he fabricated this remark on the part of Mr. Dunne as part of settling some grudge, that should be put to him fair and square by somebody. Charleton: And you suggest it should be done by me? McDowell: You asked the questions about his relationship with Mr. Dunne. Your counsel didn’t. If that is — if it is relevant, I think you should go the whole way with him, Judge. Charleton: And all the remarks you have made during the course of this Tribunal about this being an inquiry, Mr. McDowell, do they not apply to me as well? Am I not entitled to inquire? McDowell: May I make this point, Judge? Charleton: And do you think — well, I need to make a point too, Mr. McDowell, because you are very free with your language. McDowell: I am not free with my language. Charleton: Do you think, Mr. McDowell, that all the warnings about the judge entering into the arena are lost or do they not apply in these circumstances? McDowell: You are not a judge; you are an inquisitor here. And if you have — if it was relevant to make those points to the witness, I think the — that the inference that appears to be blatant in them should be put to him. 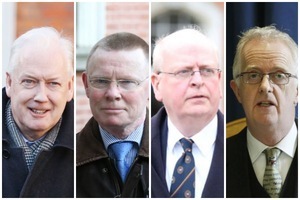 Charleton: Mr Dignam asked the questions as well, didn’t he? Charleton: Well, Mr. McDowell, it very often happens — it seriously very often happens that two people meet, they discuss matters, one comes out saying the following happened and the other comes out saying no, that didn’t happen at all. Now, it could happen, as well, that those people don’t exactly get along. Perhaps it’s because of a lack of an emotional connection that misunderstandings occur, but Mr. McGuinness has cleared it up. There is no misunderstanding here. It’s not a question of, for instance, we are adopting our strategy and it’s not going to be easy for Maurice McCabe. It’s a question of the ‘remark’, in inverted commas, being absolutely correct. Now, I really have to inquire, in circumstances where a person who allegedly made the remark says he didn’t make it and where the person to whom that remark was repeated within weeks, it seems, says, well, that never happened, as to precisely what is going on, and I think I am entitled to do that, Mr. McDowell. And I feel if I didn’t do that, I’d be failing in my duty to make an inquiry. McDowell: Well, Judge, maybe perhaps I can put the question to the witness then. Charleton: If you wish to put the question, you are certainly entitled to do so. But please don’t ascribe to me anything that you don’t know is in my mind. McDowell: Judge, you asked the questions. I queried its relevance other than in this context. McDowell: Anyway, Mr Barrett, in case anybody would draw the inference from your evidence that you have fabricated this remark by Mr Dunne and that you have done so in part to settle some score with him or because you have a very poor relationship with him or you fell out with him, what have you got to say about that? Barrett: “None of those assertions are true. Mr Dunne hired me into the organisation. I respect his background, I respect his integrity. We have a difference of view on one significant matter, which related to how we should proceed in relation to the investigation of financial irregularities at the Garda College. That is a matter of public record. I shook his hand here on the 8th January. I feel no animosity whatsoever from Mr Dunne, and that is a matter of fact. Posted in Misc and tagged Disclosures Tribunal, John Barrett, Judge Peter Charleton, Michael McDowell at 11:57 am on February 6, 2018 by Bodger. That’s fairly aggressive questioning from a judge. Obviously this isn’t like a trial or that would be very inappropriate. Perhaps Mr Charleston could have acknowledged that EU anti Fraud squad are investigating Garda College funds. As a direct result of Mr Barratts work not Mr Dunne’s I’ll add. Perhaps Mr Charleston will question Mr Dunne’s on this …..oh….maybe not in terms of reference?!!!! Yesterday he was insistent that Supt Cunningham’s report of an August 2008 meeting with Sgt Maurice McCabe was given to McDowell on the morning of May 18, 2015. McDowell tells him it wasn’t. He’s insistent it was.. and then doesn’t get the relevance of it. He seems to like playing dumb. If there wasn’t any false allegations made against McCabe, as stated in the letter from the Chief state solictor’s office, of a blackmail type threat from McCabe, then you could maybe understand Charleton’s line of questioning.. but they did go after McCabe, so it’s hardly incredulous that it was said to John Barrett that they were going after him.. Thank you for that! 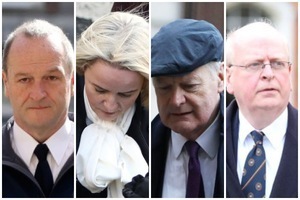 It would seem Mr Colm Smyth may be in trouble with the Bar …he had a 20 minute meeting May 21st, with NOS after the row broke out 3 days earlier at o Higgins and made no notes, failed to have solicitor present and has memory fail as to what was discussed over a mug of tae..Its ironic that one sole witness with specific recollection of a remark made is taken to task. The Chairman’s behavior within the Tribunal to date really cast a cloud over any findings to date ….